At least we have a step up on Wisconsin, where the most searched-for spelling help is for 'Wisconsin,' according to Google. MILWAUKEE — Google search figures show Wisconsinites can’t spell their own state name. 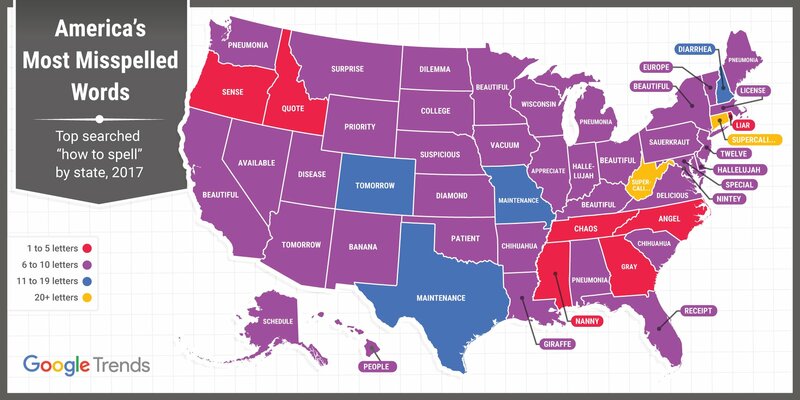 A map tweeted by Google’s News Lab team Tuesday afternoon shows the top searched “how to spell” words in each state. Twitter users responded in amusement. “‘Wisconsin’” being the most misspelled word in Wisconsin is perfect,” Jamison Stolz, the executive editor of Abrams Press in New York, mused. “You gotta love the Cheeseheads,” WildCatReport.com managing editor Louie Vaccher said. Some were a little more horrified. “Wait … people in Wisconsin don’t know how to spell … WISCONSIN? Try Massachusetts!” tweeted user @melissalac. “I’m a Wisconsinite. This is embarrassing, LOL!” Twitter user @chocolateclipse said. Maybe the Wisconsinites should be glad they don’t live in New Hampshire. The most-searched-for spelling there: diarrhea.